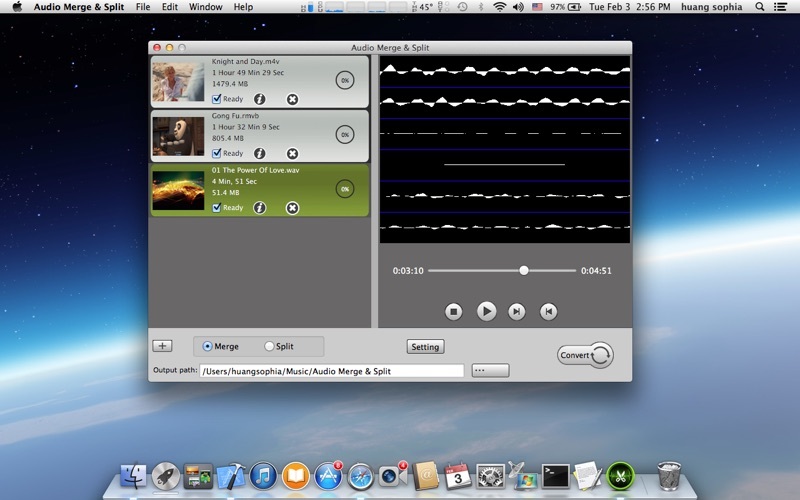 Audio Merge & Split is a simple and user-friendly audio converting(single file), merging and splitting software. For example, you can convert other audio files into *.wav, *.aiff, *.snd files with specialized formats such as adpcm、adpcm ima、pcm 8 bits, 16bit, 24bits, 32bits, 64bits, signed, unsigned, int, float, etc. 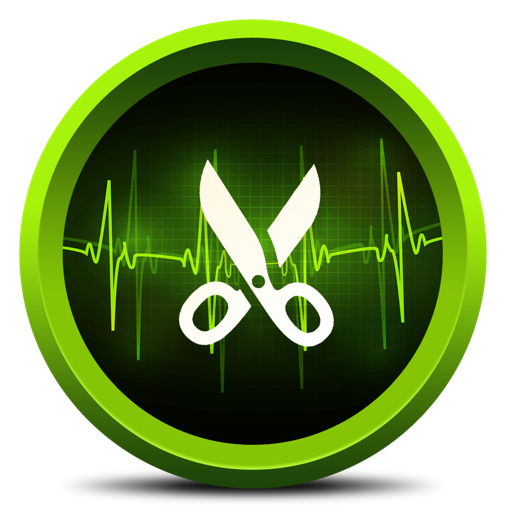 With Audio Merge & Split, you can customize your mobile phone ring tones by splitting or triming input audio stream. In other words, you can extract any audio segment from nearly all video and audio formats by specifying the start time and the end time. * Perfect Supported Output Devices:iPad,iPhone,iPod,HDV,DV,PS Vital,Xbox360,PS3,PSP,Blackberry,Nokia,Samsung,Android,Zune,Creative Zen,etc. * View All the Information of the Original Media. By Audio Merge & Split, you can view all the information of the original media file, including all audio information (encoder, sample rate, bit rate, channel, language), all video information(encoder, resolution, bit rate, aspect ratio) , all subtitle information (encoder, language). 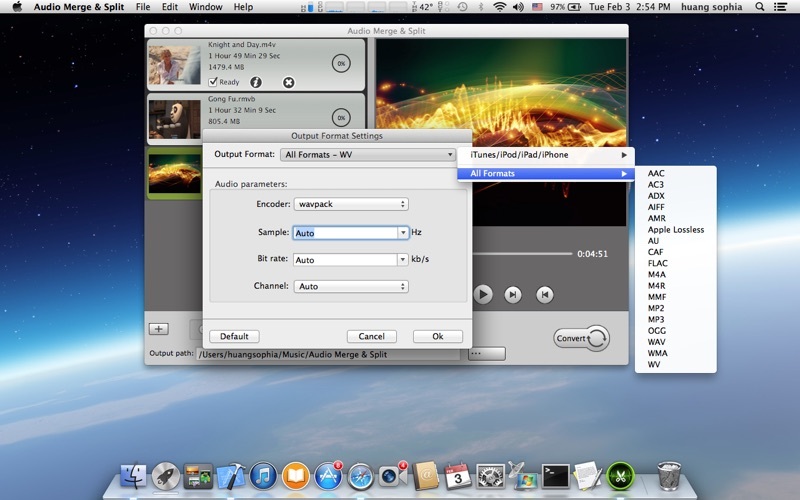 Audio Merge & Split comes with a versatile media player built-in capable of playing files in all sorts of formats. 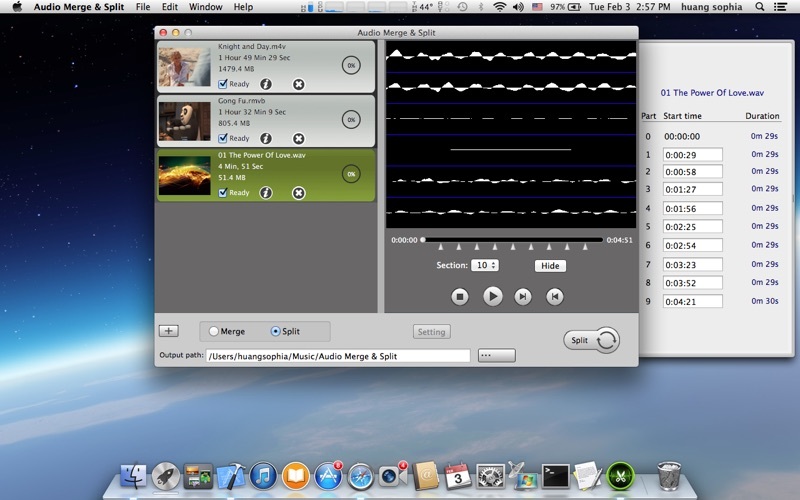 Audio Merge & Split supports hundreds of batch files. 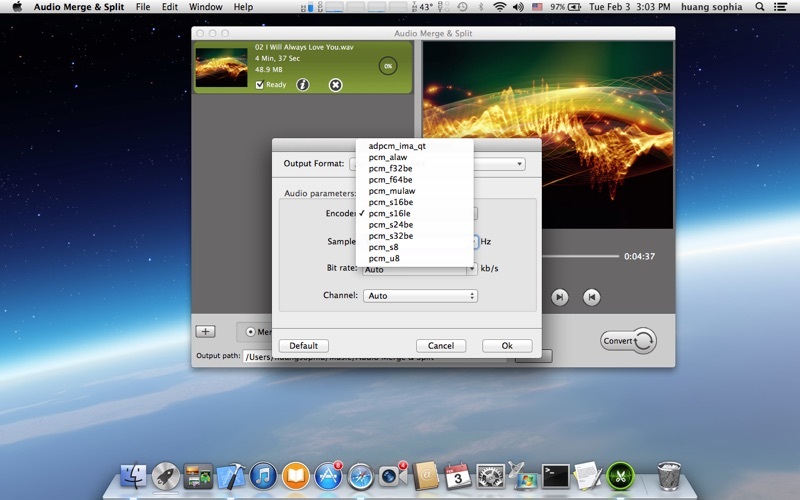 You can drag several folders with a lot of movie files to Audio Merge & Split which will be running in the background. The destination folder will be auto-populated after processing is completed. 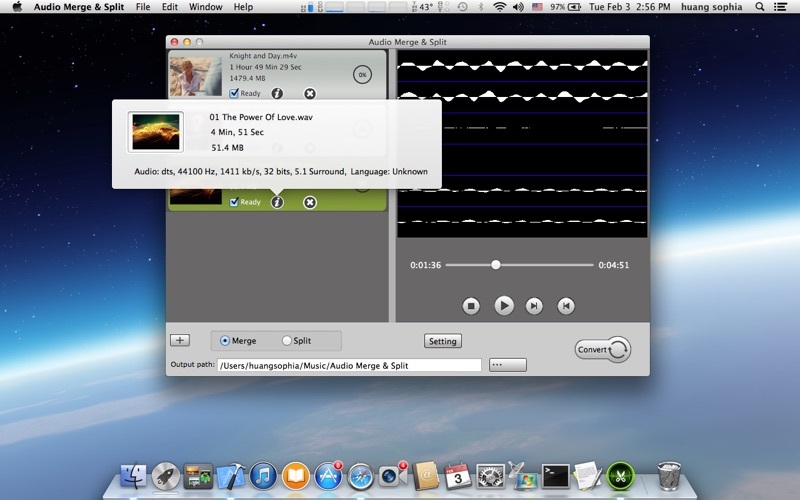 Audio Merge & Split will not do anything without your permission. It won’t automatically send files to iTunes, collecting your personal data or installing any bundled software. Fix some small bugs about split. * Now more than one hundred audio files can be merged. * Improve the output audio quality. 1. Correct a serious error about split. 2. Update development tools version.